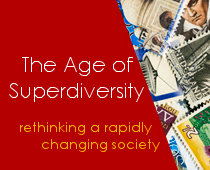 Superdiversity: Opportunity or challenge for addressing social inequality? The IRiS Key Concepts Roundtable series brings scholars together to discuss and interrogate the theoretical and analytical contours of superdiversity through its relationships to other germane concepts. 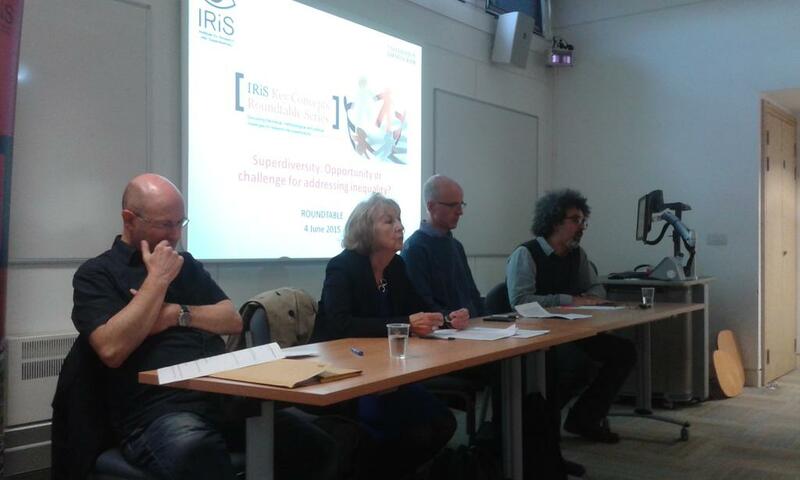 The second Key Concepts roundtable with Professor Ben Rogaly, Dr Paul Watt and Professor Gill Crozier addressed whether, and in what ways, superdiversity might assist researchers in examining inequality. Dr Nando Sigona opened the discussion by reviewing three dimensions through which the relationship between the two concepts might be examined. First, he proposed reflection on how patterns of inequality are shaping up in the 21st century, particularly in urban environments. Second, he suggested researchers examine to what extent patterns of diversification and patterns of inequality are related to each other. Finally, he introduced a third, and potentially more methodological question, regarding how the concept of superdiversity might act as an analytical lens to understand increasing inequalities. Ben Rogaly, Professor of Human Geography, University of Sussex, acknowledged the attention superdiversity gives to immigration status is crucial when thinking about inequality and has been used to great effect such as recent powerful interventions (Lewis, Dwyer et al. 2014) and current research undertaken by Hannah Jones and colleagues (http://mappingimmigrationcontroversy.com). Gill Crozier, Professor of Education, University of Roehampton London, highlighted in her opening comments that a main strength of superdiversity was to draw attention to the diversity between ethnic groups in terms of education, social class, employment and length of settlement. It is this foregrounding of the diversity within ethnic groups that she sees as useful when examining inequality in general, and educational inequalities in particular. Dr Paul Watt, Urban Studies, Birkbeck, University of London, conceived of superdiversity as a changing social reality. He observed that superdiversity operates on particular scales and in particular time periods. Drawing from Vertovec’s seminal paper (2007) Watt posited that Vertovec highlighted two spatial scales: Britain as a superdiverse country and London as a superdiverse city. Building on this he posited that researchers have gone below city level to examine superdiverse boroughs (Wessendorf 2014) and further to the neighbourhood level. Watt argued that when reflecting on different notions of scale it becomes clear very different processes are taking place. He clarified by stating ‘it is very difficult to say that the processes affecting and being affected by what is going on Hackney as a superdiverse borough are the same as what is going in the UK as a superdiverse country’. He concluded that when seen through this perspective, ‘superdiversity is probably doing too much work’. Watt argued the key to looking at inequality and mobility is to be able to account for those who are and those who aren’t able to exercise a degree of leverage regarding whether they stay or remain in a place. Watt posited to understand this kind of inequality, the focus should be on the processes through which places are reshaped and remade. He utilised the example of London where flows of capital are producing inequalities. He explained how migrant groups arrive, live in housing estates and as those estates become the focus of regeneration efforts as land prices rise, these people get moved on in complex ways. He argued that superdiversity does not help to explain such processes. Watt argued that the pace of change in London is intense and mobility flows so rapid, that the style of urban sociology and anthropology ‘enters the frame too late’ and therefore cannot account for the processes that are creating inequalities. Rogaly agreed property developers and Government driven austerity enforces mobility and can perpetuate inequality of growth and income. However, he argued that superdiversity may be a useful lens when examining enforced mobility. He noted that such mobility results in people moving to, and being newcomers in, neighbourhoods where other long-established people live. Therefore, depending on what conception of diversity is used, it is useful to explain and understand the connections between inequality and mobility in certain situations. Diversity may be caused by the inequality that moves people out of and into certain places. In addition, the prospect of a further relationship between inequality, mobility and the resulting diversity was outlined. By focusing on Sassen’s conception of the ‘global city’ (2001) and the mechanisms through which low wage jobs are created it was posited that there is an inter-dependence between flows of capital and flows of low-wage workers, creating superdiverse cities perhaps with intensified inequalities. Phillimore also noted the importance of mobility and how it feeds inequalities which are part of a changed superdiverse reality. Drawing on research with new migrants and maternity services in Birmingham, she highlighted that immigration status and the proliferation of legal categories with restricted rights and entitlements interacts with some of the other inequalities discussed to create ‘inequality squared’ (Phillimore 2014). Crozier raised an alternative reading of superdiversity related to established critiques of ‘diversity’. She explained how superdiversity can demonstrate that difference is the norm resulting in the idea that everyone embodies difference and this becomes accepted: ‘diversity is problematic because it is used as a shorthand to make generalisations. Therefore everything becomes diverse and the notion becomes meaningless as an analytical lens’. She argued that this perspective also leads to the paradox of ignoring race and prejudice: ‘the danger is that through the use of superdiversity, it eschews the much needed confrontation and challenge of racism’. She examined how diversity politics has done little to subvert taken for granted assumptions. 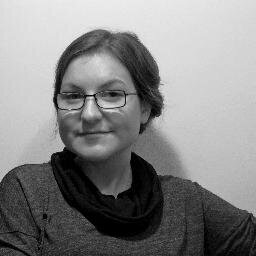 She draws on a critical race perspective to argue that new European migrants who are ‘white’ are more privileged despite their particular circumstances. This can lead to struggles for scarce resources, polarisations of ethnic groups and hierarchies of oppression. Rogaly proposed an alternative by drawing on the work of Lentin and Titley (2011) to distinguish between diversity politics and the politics of diversity. For them, he argued, diversity politics holds critical possibilities in contrast to the politics of diversity which is a governmental tool. The politics of diversity involves intense efforts to govern communities establishing good and bad diversity. Bad diversity is associated with collective protests against structural injustices including racism and economic inequality. In Lentin and Titley’s formulation ‘good diversity racialises the acceptable limits of adversarial politics’ for example to criticise British foreign policy while being a British Muslim would be bad diversity, i.e. to be poorly integrated rather than critically engaged. As Hickman and colleagues (2012) have shown diversity in this formulation carries a pre-formed idea of a core entitled identity against which immigrants and ethnic minorities can be defined as other. In light of this discussion, Rogaly warned against viewing inequality as a 21st century phenomenon. Although many recent writers have shown how it’s developed rapidly in recent years he noted that researchers shouldn’t fall into the trap of viewing intensification of inequality as a novel process. He drew on the special issue of feminist review which takes a longitudinal approach to the politics of austerity (Brah, Szeman et al. 2015). He also linked the critical diversity politics perspective to his own research in Peterborough highlighting the town’s long history of struggle and coalition building in opposition to racism led by trade unionists and faith based organisations. In addition, to highlight the historical underpinnings of the struggle of diversity politics he drew on the work of Linebaugh and Rediker who chart the process through which powerless and dispossessed people, from the early fifteenth to the seventeenth century were marshalled into serving the cause of colonial expansion (Linebaugh and Rediker 2001). Rogaly believes the critical diversity politics perspective lies at the heart of how researchers can begin to address some of the causes of inequality. Echoing Rogaly, Wessendorf commented that there are commonalities held by all kinds of different people and individuals are infinitely resourceful in their capacity to see themselves differently. She argued that superdiversity can be used as a concept to help explain these perspectives and can also be used as a resource for solidarity. However, she noted that these resources ‘need to be mined’ and therefore researchers must be attentive to the way we use categories. In particular she warned against evoking categories that create boundaries which result in making commonalities between people more difficult to realise. Sigona also raised the issue of commonality and solidarity. He questioned whether superdiversity embraces implicitly the Thatcherite notion that ‘there is no society’ and promotes the idea of ‘an atomisation of social relations’. In superdiverse contexts ‘it may seem hard to see who should work with whom to create and respond to the forces we are experiencing’. It was noted that superdiversity is mainly discussed by researchers and therefore there is a need to think about the role that research plays in addressing inequality (Berg and Sigona 2013). A largely neglected theme from Vertovec’s original paper (2007), the tools that policy makers could use to respond to superdiversity, was highlighted. This led to an examination of how research questions are conceptualised. Questions were raised such as: ‘equality for whom?’ or ‘equality of what?’ and how this could inform policy making. The discussion turned to the question of categories used by researchers. Crozier noted that questions around inequality are very important but the terms have been misused. She argued that terms such as oppression and racism are better than discussing equality of opportunity as they are more precise. In contrast to Crozier, Rogaly considered the term inequality as important to unite people, in order to chart the ways inequalities are increasing. This perspective examines ‘the one percent at the top’ rather than focusing attention (and dividing) each other. He argued while being attuned at all times to class inequality, inequality of wealth, racism and gender inequality researchers also need to start looking at who is benefiting from inequality and use that as a way of uniting us. To close the discussion, Rogaly called on researchers to undo academic hierarchies and use their skills to challenge current narratives. Drawing from Iris Marion Young’s conception of cultural imperialism (2004) he warned against falling prey to the vanity that academic frameworks can address inequality. He focused attention to the ways ‘academia sustains its own hierarchies, both through those who attend universities and those who don’t; different kinds of universities; between men and women, black and white; non-academics and academics’. He called on researchers to address processes in universities that expand and perpetuate inequality in order to make our institutions less hierarchical. This perspective raised another avenue where superdiversity and inequality can be brought into discussion. In conclusion, the debate raised many possibilities for superdiversity research to address inequality in theory, method and academic practice. In particular, a focus on the causes and consequences of mobility emerged as an area that required further investigation. The possibility of solidarity was also a question that resonated throughout the discussion without a clear resolution. However, the lively discussion provoked by these topics illustrated the potential of a superdiversity lens to bring these wide ranging debates together although further work needs to be undertaken to establish what this means in different contexts. Berg, M.L. and Sigona, N. (2013) ‘Ethnography, diversity and urban space’, Identities, 20 (4): 347-360. Brah, A., et al. (2015). “introduction: feminism and the politics of austerity.” Feminist review 109(1): 1-7. Hickman, M. J., et al. (2012). Migration and Social Cohesion in the UK, Palgrave Macmillan. Lentin, A. and G. Titley (2011). The crises of multiculturalism: Racism in a neoliberal age, Zed Books Ltd.
Lewis, H., et al. (2014). Precarious lives: Forced labour, exploitation and asylum, Policy Press. Linebaugh, P. and M. Rediker (2001). The Many-Headed Hydra: Sailors, Slaves, Commoners and the Hidden History of the Revolutionary Atlantic. . Boston, Beacon Press. Phillimore, J. (2014). “Delivering maternity services in an era of superdiversity: the challenges of novelty and newness.” Ethnic and Racial Studies: 1-15. Sassen, S. (2001). The global city: new york, london, tokyo, Princeton University Press. Vertovec, S. (2007). “Super-diversity and its implications.” Ethnic and Racial Studies 30(6): 1024-1054. Wessendorf, S. (2014). Commonplace Diversity: Social relations in a super-diverse context, Palgrave Macmillan. Young, I. M. (2004). Five Faces of Oppression. Oppression, privilege, and resistance: Theoretical perspectives on racism, sexism, and heterosexism. L. M. Heldke and P. O’Connor. Boston, McGraw-Hill Humanities Social.